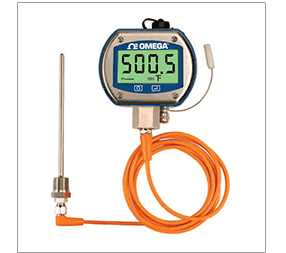 OMEGA Engineering offers a wide range of M12 Temperature Sensors in Australia. Omega’s growing family of M12 enabled sensors includes all of the common styles of temperature sensors including RTDs, Thermocouples and Thermistor sensors. Keeping with Omega’s emphasis on providing measurement solutions to meet nearly any customer application, we offer a wide selection of M12 extension cables and accessories. These include the typical PVC and Polyurethane cables, as well as a new line of fully compensated thermocouple cables. 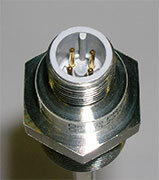 A typical PVC insulated cable with over molded connectors is shown in Figure 6. In order to provide a completely customizable line of extension cables, Omega also offers extension cables utilizing mechanically assembled connectors to which we can attach a wide variety of cable constructions, as well as enhancements such as steel over-braid and square locked hose for improved mechanical protection or electrical shielding (see Figure 7).